Lack of energy, achy joints, sore muscles - all symptoms of a bad nights rest. With Magnawool’s luxurious, therapeutic wool underlay you can sleep your way back to good health. Magnawool provides you with the energy, and well being you desire without the ongoing costs or potential danger of drugs. The gentle magnetic field generated by the Magnawool Magnetic Under-Blanket is in close and constant contact with your painful joints and muscles as you sleep. 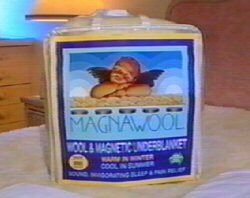 Magnawool also features a thick pile of 100% Australian Super Wash wool fleece adding to the outstanding quality and unbeatable value and comfort that you need for a restful night sleep. Simply purchase a Queen Size Magnawool Deluxe Woolen Magnetic Under-Blanket today for only $299.00 plus postage and handling and receive a free Magnawool Deluxe Magnetic Under-Blanket by merely paying the postage and handling.